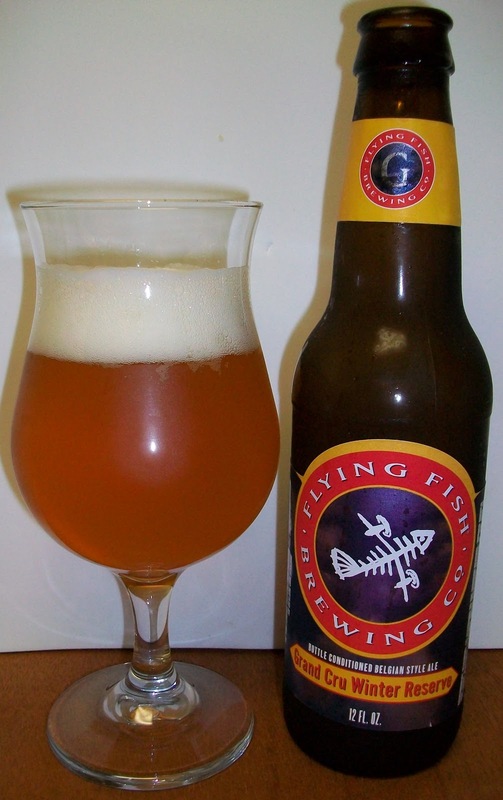 This strong golden ale showcases a variety of the ingredients and brewing methods that help differentiate Flying Fish beers. The Grand Cru is fermented at a higher temperature than our other beers adding an undercurrent of fruitiness (although there is no fruit in the beer). Very lightly filtered, the Grand Cru exhibits complex mouthfeel, strong malt flavors, a spicy hop presence and a soothing alcohol warmth, followed by a clean, dry finish. Bottle conditioned, it is excellent with food as well as served by itself. This was a gift from my pastor. We just had a very successful Craft Beer Event fundraiser and he gave this to me as little thank you. I thought that I have had this before but I really don’t remember what it was like and it was not on my current spread sheet. So lets see what this Belgian Strong Pale has in store for us. The beer pours a hazy golden yellow with orange hues and a bright white head. The nose is delightful with light pilsner type malt aromas with sweet citrus and alcohol notes on a yeasty background. Man, that’s a nice tasting ale. It’s not the best Belgian Strong Pale but it’s very good. This beer does have all the flavors of an authentic Belgian Pale. The taste starts out with sweet pale malts up front then the most pleasant mouthfeel over the tongue in the middle of the sip. The back-end is very smooth and easy drinking. The finish is great with those classic Belgian flavors with yeasty sweet citrus tang, almost funky along with pale malts and a slight hop dryness. It is really nice to experience this in an American version of this style. There are also nice refreshing notes of citrus and sweet alcohol on the finish. The final aftertaste has a slightly lingering yeasty citrus note. The head diminished fairly quickly but it has left some pretty impressive lacing throughout the experience. The Belgians styles are my favorite styles of beer. There are too many American brewers that attempt these styles but fall far short of duplicating it. This one however is pretty good. There is a unique quality to a Belgian Ale that comes from the bottle conditioning. This quality has those unique sour and yeasty notes, usually referred to as Belgian Funk. Although I would not call this one funky it comes pretty darn close. This may be lacking some of the expected complexity of a Belgian but all and all I’m pretty impressed with this ale. I’m going for a B on this one. Flying Fish as really come close to mastering the uniqueness of the Belgian Strong Pale. This is a delightful and somewhat refreshing beer with nice Belgian flavors and that touch of that “Funk” that can only be found in the Belgians.